We all would love to get more things done everyday. Unfortunately, there are only 24 hours available in each day (a few of which you will need to get some sleep). Time management methods and tools could help you get more out of your time. 2 Days is a minimalist to-do app you can use to get your things done on time. The app has a very simple design. Instead of relying on a complex time-management methodology, this app only focuses on your immediate tasks (the ones you need to do today or tomorrow). By taking things one day at a time, you will be less overwhelmed and more productive. 2 Days is so simple to use even a caveman can take advantage of it. Entering tasks and re-ordering them is easy (especially since you don’t have to deal with categories and priorities). The app does offer reminders so you won’t forget what you need to get done. 2 Days offers iCloud integration. 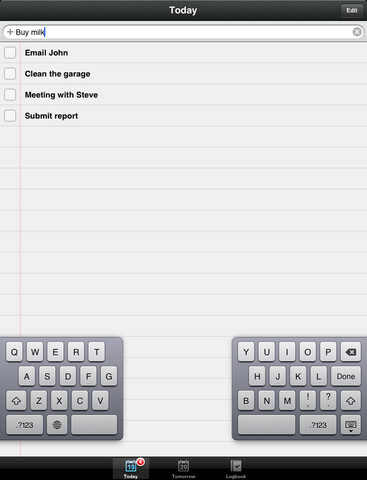 It also has a logbook that keeps track of your past tasks and lets you reuse them. 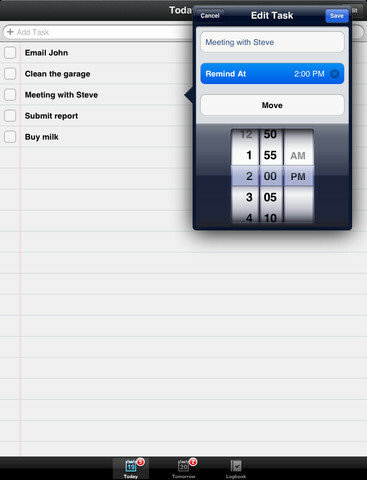 If you are looking for a to-do list manager with eye-candy features, 2 Days is not for you. The developers have gone out of their way to keep things simple in this app. It is more than capable of managing your to-do lists.